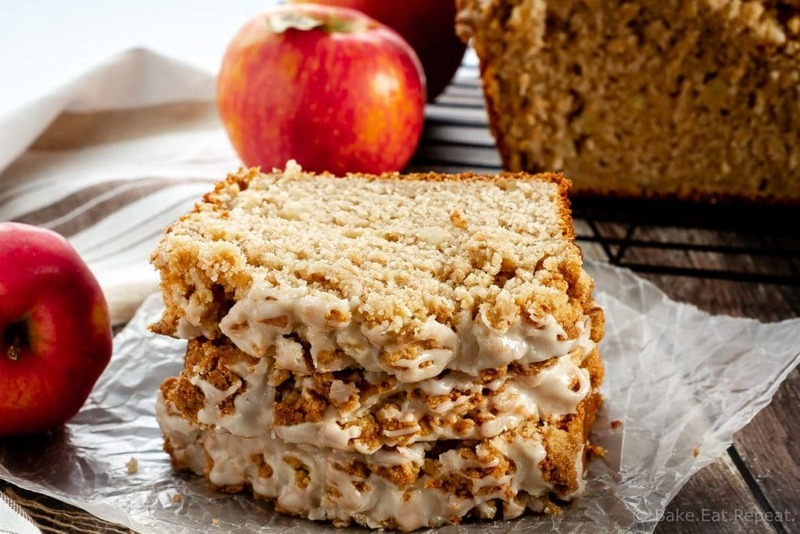 This apple bread with a crumb topping is so easy to make and tastes fantastic. 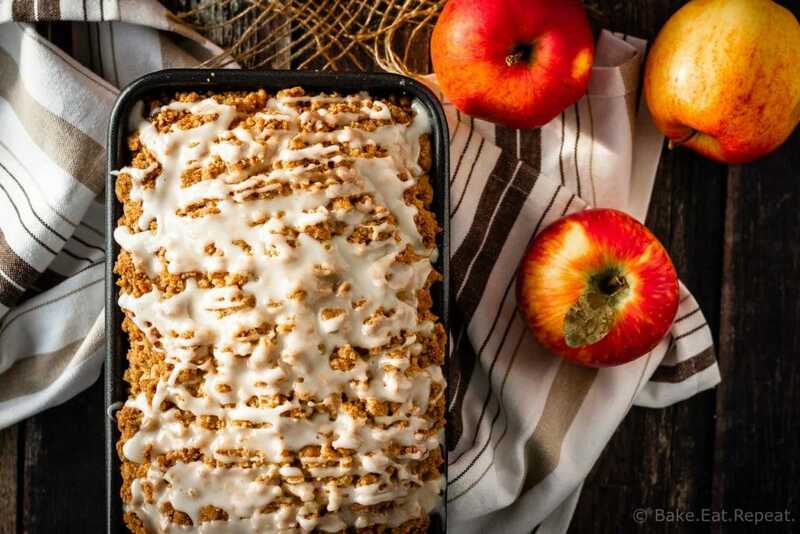 A cinnamon flavoured bread studded with apples, plus a crumb topping and a maple glaze makes the perfect treat! 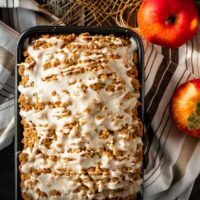 This apple bread with a crumb topping just might be one of the best things I’ve baked this fall. Of course, I say that on a regular basis. But still. You should probably trust me on this and head to the kitchen immediately if not sooner to make this apple bread. It’s so tasty. We finished off this loaf in two days with no problem at all. There are five of us here, but still, that’s pretty quick. This light and fluffy cinnamon flavoured bread filled with chunks of soft, baked apple, and covered with a crumb topping and a maple glaze is just perfect. I will definitely be making it over and over again! 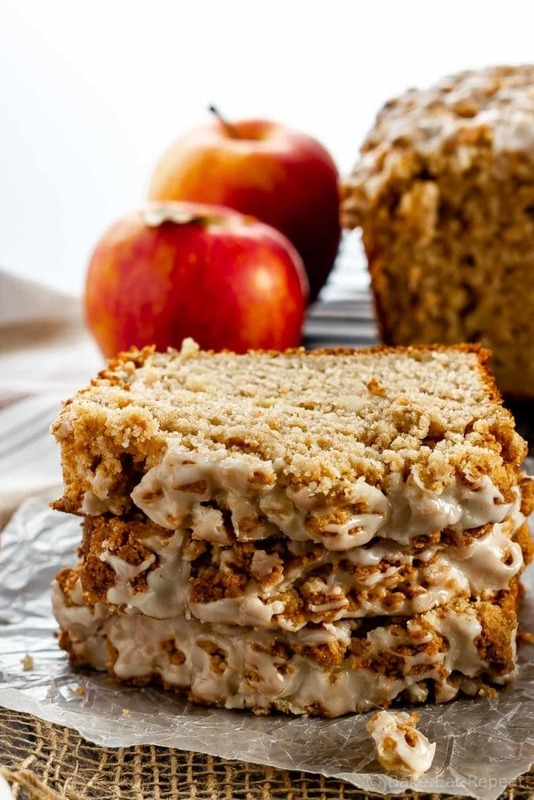 What are the best apples for apple bread? The best apples for apple bread are those that hold their shape well when cooked, such as Jonagold, Fuji, Granny Smith, Macintosh, Gala, or Honeycrisp. I typically use Gala apples for my apple bread, since those are the kind I usually have on hand. I freeze quick breads all the time. They freeze well for up to 3 months. Let the bread cool completely, then freeze it in a large ziplock freezer bag. Defrost it at room temperature. How do you make the best crumb topping? This crumb topping is super easy to make and tastes amazing. Just a few ingredients and about thirty seconds to mix them together is all it takes. If you squeeze the crumb topping mixture in your hands as you put it on the batter, it will clump together so you get those nice big crumbs on top. Make sure not to over mix the batter for your bread. This will result in a tougher texture to the bread. Mix just until your ingredients are combined. Lightly press the crumb topping into the batter after sprinkling it over top. This will help it adhere to the bread as it bakes, rather then all falling off as soon as you slice it. 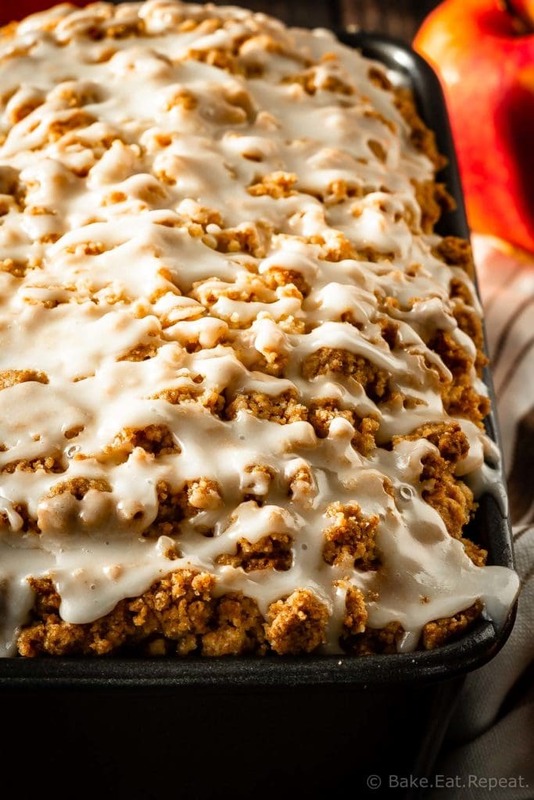 This apple bread is tasty without the maple glaze too if you would prefer to leave it off. 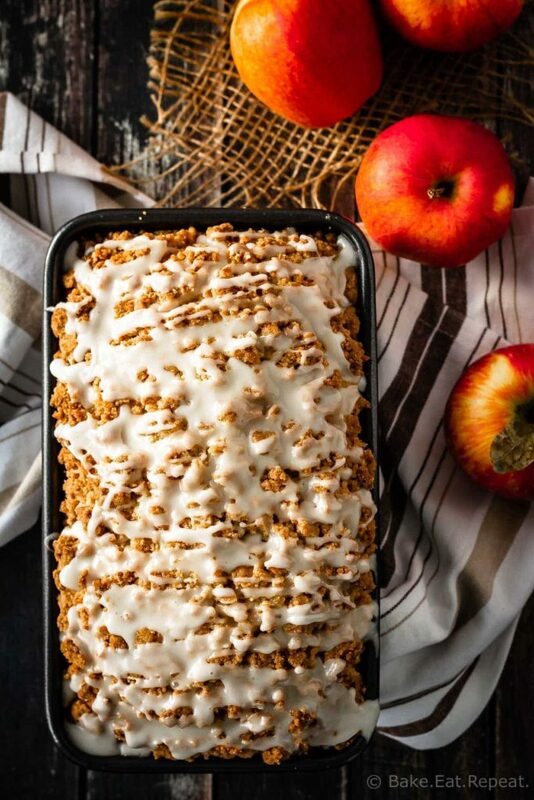 Here are a few more great apple recipes for you: Caramel Apple Blondies, Apple Cinnamon Muffins, and Apple Cinnamon Scones. Make the crumb topping - in a small bowl, combine the sugar, brown sugar, and flour. 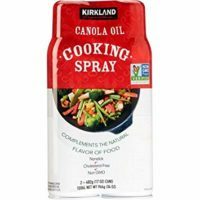 Drizzle the melted butter over everything and stir until it’s combined and clumping together. Set aside. In a large bowl, whisk together the flour, baking powder, salt and cinnamon. In another bowl, whisk together the sugar, eggs, and melted butter until well combined. Add the milk and vanilla and whisk until combined. Add this mixture to the flour mixture and stir until just combined. Fold in the chopped apples. Scoop the batter into the prepared loaf pan, smoothing the top. Sprinkle the crumb topping on the batter, pressing it lightly into the batter. Bake for 45-55 minutes, or until a toothpick inserted in the centre of the loaf comes out clean. 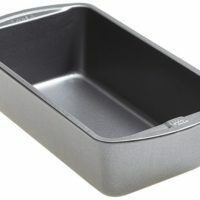 Allow the bread to cool completely in the loaf pan. In a small bowl, whisk together the powdered sugar, milk, and maple syrup until smooth to make the glaze. Drizzle the glaze over top of the cooled bread. Let the glaze set, then carefully remove the loaf from the pan and slice. Source: Adapted from my Apple Muffins with Crumb Topping. 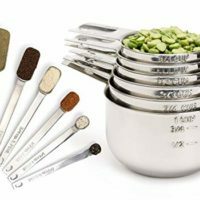 I make every recipe my own too - nothing wrong with that! :) Glad you enjoyed it!